Here's a short coincidence story via JC, who often sends me interesting bits and pieces. It's the sort of happening, though very simple, which can make quite an impression. "I was watching an episode of the Simpsons one day whilst listening to the Motorhead song 'Ace of Spades' on my iPhone. As you do. 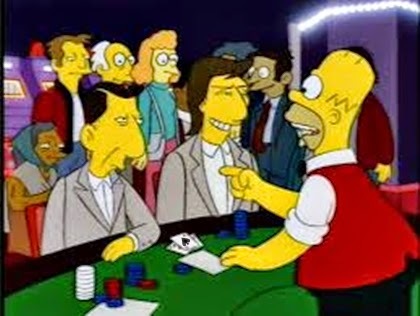 Homer was in a casino playing blackjack I think. As he turned over the ace of spades card, the lyric 'the Ace of Spades' was 'sung' by Lemmy. In the exact same instant! It was a simple but quite startling coincidence." Here's another little coincidence.I was watching a DVD on my computer of the Tom Cruise movie "Jack Reacher". I paused it to check my emails and blog feeds,only to come here and see Tom in cartoon form in The Simpsons,and I wouldn't be surprised if Homer just dealt a Jack of some suit,as well. God one! Yours too, Daz. Love it when stuff like that happens. Oops, that was supposed to be GOOD! Do We Know The True Three Secrets Of Fatima? Is There Such A Thing As Time?